I have heard a lot of differences between the 2, but, not a straight answer to which one is better. It’s very hard to judge. In one hand Disney World is 40 square miles (approximately the size of San Fransisco) and Disneyland is only about 160 acres. Big difference, but, did you know Disneyland had more rides? I came across this article that was very informative! One of the most common questions people planning their first Disney trip ask us is whether they should visit Walt Disney World or Disneyland. In the past, we’ve offered vague email advice that essentially amounts to ‘it depends.’ However, we feel it’s a topic worth exploring in a bit more detail expanding on that a little to explain why it depends, and cover this popular topic, but not in a typical trolling manner. This is a highly divisive subject and these comparisons commonly are thinly veiled attempts to assert one resort’s superiority over the other. Rather than inciting controversy, we’ll attempt to analyze the actual differences between a trip to Walt Disney World and a trip to Disneyland Resort. First time guests probably don’t know or understand why this is such a controversial topic among Disney fans. Despite both resorts being owned by the same company (so this isn’t exactly a Coke v. Pepsi debate), many fans of Walt Disney World feverishly defend any claims that Disneyland is superior in any way, with Disneyland fans doing the opposite. I guess the best way to describe it would be like a sibling rivalry, but in here the rivalry would be between friends of the siblings. If that doesn’t make sense, don’t worry, it doesn’t make much sense to us either. Since this article is in response to questions from casual guests, it’s geared towards those guests. If you’re a veteran of one coast or another, we highly recommend you visit the other coast–an article explaining why probably isn’t necessary. As for casual guests, a note on sometimes confusing vernacular. Walt Disney World Resort includes four theme parks: Magic Kingdom, Epcot, Disney’s Hollywood Studios, and Disney’s Animal Kingdom. Disneyland Resort includes two theme parks: Disney California Adventure and Disneyland Park. (The word “Disneyland” in casual use sometimes refers to the park and sometimes refers to the resort complex encompassing both parks and more…confusing enough?) When we refer to Walt Disney World and Disneyland Resort here, we’re referring to the entire resorts. With that in mind, let’s try to compare these apples and oranges anyway, to help those who haven’t visited both determine whether they’re more of an apple or an orange person when it comes to Disney theme parks. We mentioned above that Disneyland works better for our current vacation style. The nature of your vacation is probably the most important aspect of determining whether Disneyland or Walt Disney World is right for you. Our style is quick, weekend trips, and the smaller footprint and walkable nature of the Disneyland Resort accommodates these trips better. By contrast, an international guest wanting to take a 21 day vacation focused solely on Disney probably is going to have a better time at Walt Disney World. When pitching his Florida Project, Walt Disney discussed the “blessing of size” it would have. We think it’s fair to say the size of Walt Disney World is both a blessing and a curse. In the “blessing” column, you have the sheer scope and scale of Walt Disney World. There are 4 theme parks, 2 water parks, 25 Disney-owned hotels, and other assorted entertainment and shopping at Walt Disney World. Each of these parks and hotels has its own draws and activities, from rides in the parks to things like fishing and fine dining. Walt Disney World truly feels like a place where you can take an all inclusive vacation. You can only spend so much time in the theme parks, but you could easily spend a full week doing other things at Walt Disney World. It feels much more like a destination resort. If you want to take a long Disney vacation, this is a definite advantage for Walt Disney World. In the “curse” column, because of its size and spread out nature, getting from place to place at Walt Disney World can be very time consuming, regardless of whether you rent a car or rely upon Walt Disney World transportation (although it’s typically worse if you rely on them). Park Hopping requires no less than a 30 minute commute and getting to a restaurant in a resort hotel requires the same–and these are just minimums. While relying on Disney transportation, we’ve wasted well over an hour trying to get from our hotel to another hotel where we had dining reservations. If you’re taking a shorter trip or Disney is only one element of your vacation, all of this wasted time can be seriously off-putting. Park Hopping at Disneyland Resort takes 5 minutes or less, and can be accomplished on foot. Getting to a resort hotel takes 15 minutes or less, and can be accomplished on foot. Downtown Disney is 5 minutes from the parks, too. If you don’t want to stay at a Disney-owned hotel, you can find a cheap off-site hotel that’s a 10 minute walk for $100/night or less. Commuting time is minimal at Disneyland Resort, but there is much less to do. Most people are not going to be able to spend a full week at Disneyland Resort. Disneyland Resort is much better geared towards short trips, or trips that incorporate more than just Disney theme parks. Which is better if you want to do other things? Again, that depends. (Really helpful article, right?!) Orlando has become known as the theme park capital of the world, and this is not just because of Walt Disney World. There’s also Universal Orlando, SeaWorld Orlando, LegoLand, and many more. Southern California has its own mix of theme parks, including Knott’s Berry Farm, Universal Studios Hollywood, and Magic Mountain. If you’re looking to make a grand circle tour of theme parks, Orlando should be the clear winner. If you want to do things outside of theme parks, it’s tough to beat California. California has 9 National Parks (including my personal favorite in all of the US, Yosemite National Park), more bio-diversity than any other state, Hollywood, and the Pacific coast, among many other things. Florida has theme parks, the Everglades, and the Kennedy Space Center. A lot of people have a strong bias against California based on traffic congestion and other preconceived notions, and a California vacation may not be for these people. We skew in the other direction, finding California to be the most beautiful and enjoyable state in the United States. Given the above differences, a direct dining comparison is difficult to accomplish. Walt Disney World simply has more restaurants by virtue of its size. This is especially true of nice dining options in the Disney-owned resort hotels. If you want to do a lot of fine dining and plan on visiting the resort hotels, Walt Disney World is the clear winner here. Of course, this requires time. As mentioned, getting to some of these Walt Disney World hotels can be difficult, and if you believe that you realistically won’t make it to these hotels, the gap narrows. Walt Disney World still has more nice, in-park table service restaurants. Plus, many of the best out-of-park restaurants are easy to access via monorail or walking from Epcot’s International Gateway. Really, no matter how you slice it, if nice table service dining is a focus of your vacation, Walt Disney World has the edge. If you’re planning on eating at most only a few nice meals regardless of where you go, the dining difference becomes minimal. You will be hard pressed to pick three restaurants at Walt Disney World better than the top three restaurants at Disneyland Resort: Carthay Circle Restaurant, Napa Rose, and Steakhouse 55. Nightlife is fairly lacking on both coasts. Walt Disney World has bars in many of its Deluxe and Moderate resort hotels, some of which are nice, but its nightclub district, Pleasure Island, closed a few years ago. Likewise, Disneyland Resort has a few bars in hotels and Downtown Disney. Its standout option (that we happen to love) is Trader Sam’s, a quirky tiki bar that can be fun even for non-drinkers. The reputation of counter service, or “fast food” dining at Walt Disney World historically has been better than Disneyland Resort. Beginning in 2010 through the present, Disneyland has made massive strides to improve the quality of its counter service dining. Much of the internet continues to perpetuate the belief that Disneyland Resort counter service dining is sub-par, but this is based on stale information. Counter service dining is now arguably superior at Disneyland Resort, which has many standout options that rival table service restaurants. Reasonable minds may vary on this, and arguments can be made in support of Disneyland or Walt Disney World having the superior options in this regard. Regardless of which you prefer, the quality difference is now minimal. The bottom line is that you now can find great counter service options in both Disneyland and Walt Disney World–there’s so much “beyond burgers” and the normal theme park fare at both. In the Disney vernacular, attractions encompasses rides, stage shows, and more. Basically, anything listed on a park map that isn’t a restaurant or gift shop. Since Walt Disney World has double the theme parks of Disneyland, it would stand to reason that it also has significantly more attractions. This is not the case. Depending upon what you count (interactive games? meet & greets?) there are approximately 105 attractions in Walt Disney World and approximately 90 in Disneyland. Again, that number varies depending upon what you include, but regardless of what’s included, the difference in the number of major attractions in Walt Disney World and Disneyland is about 10. Which has the better attractions is a matter of taste (more on this later), but the attraction density the Disneyland Resort parks is higher. There are numerous inferences that can be drawn from this. The fact is that the average guest can only hit so many attractions per day, and that number is typically less than the number of attractions in Disneyland, meaning that for many people it’s a question of whether they’d rather spend multiple days completing a single park or multiple days completing multiple parks. While the number of attractions in Disneyland is higher than the average number most guests will hit in a day, the average number is right around the number of attractions in Disney’s Hollywood Studios and Disney’s Animal Kingdom. This can be problematic for some guests because disinterest in a handful of these attractions (it’s unlikely that every guest will be interested in every attraction) can mean that a single park can be finished in less than a full day. This has led to many fans (even Walt Disney World fans) describing these two parks as “half day parks.” Conversely, many fans argue that they are full day parks. Which each park is for you will depend upon your interest in stage shows and animals. Regardless of the raw attraction numbers and the distribution of those attractions, we think it’s fair to say that the average guest will spend at least one day more satisfactorily completing the Walt Disney World theme parks than it would take to satisfactorily complete the Disneyland Resort theme parks. For us, that means 4 days in the theme parks at Walt Disney World and 3 days at the theme parks in Disneyland Resort. The total number of days you spend in the theme parks will likely vary, but we think this +1 day difference assumption will more or less hold true. In terms of attraction quality, this is also highly subjective and intensely debated. In terms of the big picture, the attractions that are typically considered iconic Disney attractions exist on both coasts. Haunted Mansion, Pirates of the Caribbean, ‘it’s a small world’, Jungle Cruise, Mad Tea Party, Big Thunder Mountain, Splash Mountain, the Enchanted Tiki Room, and others exist at Disneyland Resort and Walt Disney World. In fact, the list of overlapping “big name” attractions in Walt Disney World and Disneyland Resort is so long that most first-time guests might not even notice a significant difference in attractions at Walt Disney World versus Disneyland Resort. There are plenty of differences, though. Two super-headliners at Disneyland Resort that are considered to have no equals at Walt Disney World are Indiana Jones Adventure and Radiator Springs Racers. Many popular attractions existing in both locations are considered superior at Disneyland Resort. The most prominent examples of this are Pirates of the Caribbean (which is noticeably longer at Disneyland), Space Mountain, and ‘it’s a small world’. Disneyland also has more rides in its Fantasyland, including Mr. Toad’s Wild Ride, Storybook Land Canal Boats, Snow White’s Scary Adventures, Casey Jr., Pinocchio’s Daring Journey, and Alice in Wonderland. Walt Disney World does have a “New Fantasyland” that it just opened and has been featured heavily in recent marketing in addition to its regular Fantasyland, but this doesn’t add much to the equation that Disneyland Resort doesn’t already have, besides a restaurant and meet & greet–it’s mostly just a pretty themed environment. Disney California Adventure also has the new “Cars Land” (where Radiator Springs Racers is located), which has proven a huge draw, especially for parents with kids who are fans of the film Cars. It’s really like walking into that movie. Walt Disney World has its own advantages, and a number of experiences that don’t exist at Disneyland. Virtually all of Disney’s Animal Kindom is unique to Walt Disney World, and anyone who loves animals will likely enjoy the many zoological attractions in this park that include Kilimanjaro Safaris, Maharajah Jungle Trek, Flights of Wonder, and Rafiki’s Planet Watch. There are also other unique attractions here, such as Expedition Everest, Dinosaur (which uses the same ride system as Indiana Jones Adventure, but is decidedly different), Finding Nemo: The Musical, and Festival of the Lion King. Epcot also has many attractions that can’t be found at Disneyland Resort, and its World Showcase nations are a big draw for adults interested in eating or drinking their way around the world. In terms of nighttime spectaculars like fireworks, Disneyland’s main fireworks show, “Remember… Dreams Come True!” is the best ‘castle park’ fireworks show we’ve ever experienced, but we acknowledge bias here because we have an emotional connection to Disney theme parks, and it focuses on those. 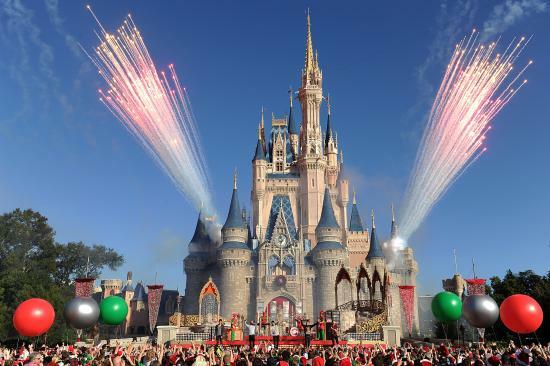 The Magic Kingdom’s “Wishes!” fireworks might be just as special for a first-time guest. For all guests, Disneyland’s version of Fantasmic is superior to the version of Fantasmic shown at Disney’s Hollywood Studios. Disney California Adventure has World of Color and Epcot has Illuminations, which are in no way comparable to one another. Illuminations is a beautifully scored and emotional show that has no connection to Disney characters. World of Color is an jaw-dropping display of colorful fountains centered around a montage of Disney films. As a general rule, the maintenance of attractions is better at Disneyland Resort. This is not a hard and fast rule, and if you’re a first time visitor to either, chances are you won’t even notice a difference. This is a variable that really only affects astute eyes. The differences in attractions between Walt Disney World and Disneyland Resort is pretty substantial to the serious fan, but the difference in which has the better slate is going to vary from person to person depending upon that person’s unique interests. I find the lack of a Peoplemover and relaxing Audio-Animatronics shows like Country Bear Jamboree and Carousel of Progress to be Disneyland’s biggest faults. However, I recognize that these are things that appeal to me more than the average guest, so I don’t think they bear mentioning when highlighting the biggest differences. The biggest actual differences in terms of attractions are probably the zoological attractions in Disney’s Animal Kingdom (and The Seas pavilion in Epcot) at Walt Disney World and the additional dark rides and other classic rides in Disneyland’s Fantasyland. These things could tip the scale one way or the other for some guests. These are the biggest high-level differences. We could spend thousands of words covering all of the many differences in attractions between Disneyland Resort and Walt Disney World, but even such a thorough list would offer little assistance in determining which is better for you on the basis of attractions because you might have some quirky individual preference that’s missed completely by the list. All things considered, we think most guests will fairly equal enjoy the attractions at Walt Disney World and Disneyland Resort. The most commonly cited difference in ambiance is by way of the castles in each of the “Castle Parks” (Disneyland and the Magic Kingdom). Cinderella Castle in the Magic Kingdom is best described as large and grandiose. Sleeping Beauty Castle in Disneyland is best described as small and charming. The debate on which is “better” could rage forever, and we think it depends upon which you experience first. These castles are also indicative of the overall ambiance of Walt Disney World and Disneyland Resort. In general, Walt Disney World is large and grandiose. Everything is more spread out, the parks occupy larger spaces, and everything is flat out big. Disneyland Resort occupies less space and in general things just seem smaller. Which you prefer is going to be a matter of personal preference. Some people think Walt Disney World is sterile, and Disneyland is intimate. Some people think Walt Disney World is spacious, and Disneyland is claustrophobic. Beyond that, as touched upon above, Walt Disney World is isolated from the real world. If you stay in an on-site, Disney-owned hotel there, you might never come into contact with the “real world” for the duration of your trip. Some people love this (us included). At Disneyland Resort, it’s possible to escape the real world, but this illusion breaks down from time to time because real world establishments are just outside of the parks. Some people love this, as access to the real world (and its cheaper food and amenities) is important to them. The real world ‘buffer’ at Walt Disney World makes escapism easier, but the trade-off is that it makes commuting around the massive resort more time consuming. In general, Disneyland Resort has more live entertainment (which could be counted in the “attractions” section above, but I consider these random entertainers more about ambiance than anything else), but there is live entertainment in all parks. Holiday ambiance is another consideration. Both Disneyland Resort and Walt Disney World Resort celebrate Christmas (here’s an overview of what Walt Disney World does for Christmas). Walt Disney World seems to have more holiday spectacle, while Disneyland Resort has a couple of impressive holiday overlays to its attractions. We give the slight edge to Walt Disney World here, even though we really love Haunted Mansion Holiday and ‘it’s a small world’ holiday at Disneyland. Perhaps World of Color “Winter Dream,” which debuts this year, will make it a draw. Like the rest of this article, this is just a high-level look at differences in ambiance. There are numerous other specific differences. Places like the World Showcase in Epcot, the gritty and realistic countries in Disney’s Animal Kingdom, New Orleans Square in Disneyland, and Golden State in Disney California Adventure–among just about every other land in each of the parks–all of their own distinct ambiance that can be a specific draw to specific people. Both Walt Disney World and Disneyland, for lack of a better term, have that aura of “Disney magic” to them, and you don’t get a lesser experience in terms of this by going to either. Fans of one or the other might argue otherwise, contending on opposite sides that Walt Disney World is more magical because it was what Walt Disney envisioned to “fix” the errors of Disneyland, and that Disneyland is more magical because it is the only theme park that has Walt Disney’s personal touch on it (Disneyland is the only finished park he ever set foot in). This is fanboy fodder–a regular guest is going to have an equally “magical” experience in either location. There is no noticeable difference in Cast Members. Many people claim there is, but they base these claims on anecdotal negative experiences in one location or the other–it’s almost as if they have an ax to grind as a result of a single negative encounter. We visit both Walt Disney World and Disneyland Resort multiple times per year, and we are confident in saying that most Cast Members are great on both coasts. There are a few bad apples on both, as well. If you visit Walt Disney World once, and then visit Disneyland Resort once, you may feel that the Cast Members at one are “better” than those at the other. Increase your sample size to 10 trips to each and see if you feel the same. Personally, I’m skeptical of the objectivity of anyone who passionately claims that the Cast Members on one coast are better than those on the other. Crowds in Disneyland and crowds in Walt Disney Worldor more or less the same, just composed of different demographics and with slightly different day-to-day trends. Disneyland has more local Annual Passholders whereas Walt Disney World has more tourists. Annual Passholders at Disneyland typically only pose a “problem” for tourists when it comes to the nighttime spectaculars. Since these guests can visit whenever they want, they have no sense of urgency. Many of them don’t mind dropping in after work with an iPad or book and grabbing a spot for Fantasmic or the fireworks a few hours in advance. However, Walt Disney World’s guest demographic includes the dreaded tour groups. Whether these be Brazilian kids, cheerleaders, youth groups, etc., they are large, under-supervised, and often unruly groups. (Get that many kids together with little supervision and their background is irrelevant–they will misbehave.) We have never had any serious issue with these groups, however, there are plenty of horror stories. Chances are that they won’t pose a problem for you, but if you get in a long line right behind one of these groups, even the most patient person may lose their cool by the end of the line. In practice, these differences in demographics are a relative non-factor. The busy seasons at Disneyland are the busy seasons at Walt Disney World, and the slow seasons are also the same at each, with minor variances. We consider differences in crowds at one versus insignificant. Florida is the Sunshine State and California has a “Sunshine Tax.” Despite the descriptors, the two have decidedly different weather. The commonality, of course, is the sun. Unfortunately, with the sun in Florida comes humidity, tropical storms, season changes, and regular afternoon rain showers. Average annual rainfall is about 15 inches in Anaheim (as compared to 50 in Orlando) with far fewer rainy days, less humidity, and fewer storms. It gets hot in Southern California, but it’s normally a dry heat. In general, the weather is fairly consistent and pleasant year-round in Anaheim. This is one area where ‘it doesn’t depend.’ For most of the year, weather is decidedly better at Disneyland Resort. As far as in-park costs go, Disneyland Resort and Walt Disney World are comparably priced. Ticket prices are about the same, as are food prices and souvenirs. Disneyland Resort does not have multiple hotel tiers, so if you stay at one of the three Disneyland Resort hotels, expect to pay a lot per night of your stay (about as much as you’d pay at a Walt Disney World Deluxe Resort). Walt Disney World’s Moderate and Value Resorts are less expensive. However, off-site hotels are Disneyland Resort are much more conveniently located to the parks than off-site Walt Disney World hotels. We typically pay less for our off-site hotel at Disneyland Resort than we do for our on-site Walt Disney World hotel, and that off-site hotel is closer to the parks at Disneyland Resort than the hotels at which we stay in Walt Disney World! It’s touched upon above, but it’s important to know that not all Walt Disney World hotels are conveniently located. Other costs are going to vary widely depending upon where you live and what else you plan to do. Don’t just assume that because you live closer to one resort complex, that airfare to that one will be cheaper. As a general rule, that seems to be true, but there are exceptions. We live in Indianapolis, and airfare for each of our Disneyland Resort trips this year has been cheaper than airfare for our Walt Disney World trips. It helps that there are four airports near Disneyland Resort–make sure to check flights into each of them. Okay, I think that covers the big differences and should provide a nice basis to help potential guests figure out whether Disneyland Resort or Walt Disney World is right for them. As mentioned numerous times throughout this article, this is mostly high level differences, and doesn’t attempt to focus on the myriad of specific differences between the resorts. So before you scream, “YOU IDIOT, HOW DID YOU FORGET HEIMLICH’S CHEW CHEW TRAIN? THAT IS SUCH AN IMPORTANT ATTRACTION TO ME!” in the comments, remember that this article would have to be 10 times as long as it is to focus on every little difference, and then it probably would be a bit overwhelming to a first time guest. However, if you do have some specific differences that you think are important, I encourage you to share them in the comments. That’s what the comments are there for, and anyone contemplating a trip would probably be well-served by getting a different take on the comparison, anyway. I just ask that you be respectful and reasoned in your thoughts. This isn’t a place for turf wars or conjecture. And really, at the end of the day, most people are going to have a good time regardless of whether they go to Disneyland Resort or Walt Disney World, so long as they properly prepare for the trip. On that note, if you’re planning your first visit to Disneyland Resort or Walt Disney World, make sure to read our Walt Disney World Trip Planning Guide and Disneyland Trip Planning Guide. A well-planned trip will make all the difference in the world in terms of enjoyment, and for how expensive Disney is, it’s certainly worth taking a few hours to do a little planning to insure your trip “investment” pans out!